Tiffen has released version three of the Tiffen Dfx digital filter suite. The new Tiffen Dfx 3.0 boasts enhanced multi-processor acceleration for faster interaction and rendering of images, brand new filters for optical effects, updated host support, interface improvements and more. The Tiffen Dfx 3.0 Video/Film plug-in is available today for $599.95. One Tiffen Dfx Video/Film plug-in licence will allow it to run in Adobe After Effects, Adobe Premiere Pro, Apple Final Cut Pro 6/7 and Avid Editing Systems if installed on the same machine. The Tiffen Dfx 3.0 Photo plug-in is available at an introductory price of $199.95. One Tiffen Dfx Photo plug-in licence will allow it to run in Adobe Photoshop, Adobe Photoshop Elements, Adobe Photoshop Lightroom and Apple Aperture if installed on the same machine. Finally, the standalone version of Tiffen Dfx 3.0 is available for $169.95. 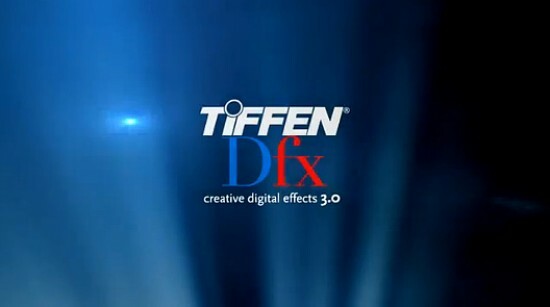 The Tiffen Company today announces the release of the highly anticipated version three of the popular Tiffen Dfx digital filter suite. A powerful and robust video and still image editing effects suite, Tiffen Dfx 3.0 boasts enhanced multi-processor acceleration for faster interaction and rendering of images, 10+ brand new filters for optical effects, updated host support, interface improvements, and more, taking still and moving image editing to the next level of visual brilliance. Hauppauge, New York - The Tiffen Company, a leading manufacturer and distributor of award-winning accessories for the still imaging, motion picture, and broadcast markets, is pleased to announce the release of the highly anticipated version three of the popular Tiffen Dfx digital filter suite. A powerful and robust video and still image editing effects suite, Tiffen Dfx 3.0 boasts enhanced multi-processor acceleration for faster interaction and rendering of images, 10+ brand new filters for optical effects, updated host support, interface improvements, and more, taking still and moving image editing to the next level of visual brilliance. Simulating 2,000+ popular award-winning Tiffen glass filters, specialized lenses, optical lab processes, film grain, exacting color correction, plus natural light and photographic effects, the Tiffen Dfx digital filter suite is the definitive set of digital optical filters for professional photographers, top motion picture filmmakers, video editors, and visual effects artists around the world. “Whenever I shoot in HD, I always look for new, more efficient ways to take the edge off of the sharp, inorganic nature of the format,” comments Saro Varjabedian, Director of Photography and Cinematographer, Eliot Loves. “With Tiffen’s Dfx v3 software I can easily apply filters such as film grain, bleach bypass, black diffusion, or glimmer glass to help texturize and soften the inorganic nature of HD recordings. The new Tiffen Dfx software makes for a wonderful companion to Tiffen’s trusted line of optical filters.” Watch the new Tiffen Dfx v3 Promo Video via the link below. * Color Shadow: Creates a high contrast image overlayed with a gradient, simulating the look and feel of those colorful iPod(R) commercials. * DeBand: Removes banding artifacts from an image by smoothing pixels in banded areas while retaining detail. Banding frequently occurs, in blue skies for instance, with DSLR’s as well as digital cameras. DeBand effectively smoothes out this unwanted banding. * DeBlock: Removes blocking artifacts created as a result of high compression factors, such as overly compressed JPG images which often cause square blocking artifacts. * DeNoise: Grain and noise from digital cameras, whether still or video, is a common problem. DeNoise removes the grain and noise while still retaining detail. * Film Stocks: Simulates 113 different color and black & white photographic film stocks. For those desiring the look of either old or current film stocks, there are simulations of many of the popular brands from Kodak(R), Fuji(R), Agfa(R), Polaroid(R), and Ilford(R). * Glow Darks: Glows and grows the dark areas of an image, creating a stylized, dreamy dark glow. * Key Light: Relights images with a directional or point light. Changing the lighting after an image has been photographed gives the photographer/editor control to fix or enhance their images, as well as create interesting lighting effects. * Rays: Creates stunning and realistic light ray effects quickly and easily. Rays can add shafts of light streaming through clouds, rays filtering through a forest canopy, beams of light on a foggy night, or rays shooting through an interior window. Rays adds a striking and dramatic quality to any image. * Texture: Applies textures to an image for a stylized look. Adding texture to an image is a great way to create a unique and customized look. * Match: Matches the color, detail, grain, and tone of one image and applies it to another. In addition to the above new features and capabilities, v3 is updated with multiple bug fixes, feature enhancements, and key changes to make the visual effects workflow smooth and efficient for all types of users. Among the most noteworthy feature enhancement is the implementation of multiprocessor acceleration to dramatically speed up the majority of filters. The more processors a machine has, the faster the interaction and rendering. Further feature enhancements include, the availability of the Tiffen Dfx custom user interface in Adobe(R) After Effects(R), Adobe Premiere Pro, Apple(R) Final Cut Pro(R) 6/7 and Avid(R) Editing Systems, the addition of Adobe Photoshop Lightroom as a supported host, the acceleration of EZ Mask on multiprocessor machines, and new brushes in the Paint filter such as Black/White, Repair, Mosaic, Blur, and Scatter. The Tiffen Dfx v3 Video/Film plug-in is available today for $599.95 USD. One Tiffen Dfx video/film plug-in license will allow it to run in Adobe After Effects, Adobe Premiere Pro, Apple Final Cut Pro 6/7 and Avid Editing Systems if installed on the same machine. The Tiffen Dfx v3 Photo plug-in is available today at an introductory price of $199.95 USD. One Tiffen Dfx photo plug-in license will allow it to run in Adobe Photoshop, Adobe Photoshop Elements, Adobe Photoshop Lightroom and Apple Aperture if installed on the same machine. The Standalone version of Tiffen Dfx v3 is available today for $169.95 USD. Tiffen is currently investigating Tiffen Dfx compatibility with FCP X for a future release.